The ZAC Foundation and the Boys and Girls Clubs of America run four-day water safety camps at pools across the country. At Joint Base Andrews in Maryland, kids at day two of the camp still seemed nervous before jumping into the pool. See photos. JOINT BASE ANDREWS — Dozens of kids clustered poolside, some dangling their feet in the water and others hanging back, still seemed nervous on the second day of the water safety camp at Joint Base Andrews in Maryland. “This is the most important part of swimming: learning to control your breathing,” he told the children, who ranged in age from 5 to 9 years old. The camp is part of a program to teach children to swim and combines fun activities while emphasizing safety. It’s the work of the ZAC Foundation, created by Karen and Brian Cohn of Connecticut. Their 6-year-old son Zachary died after becoming trapped in a drain in their backyard swimming pool. The ZAC Foundation and the Boys and Girls Clubs of America run the four-day camps at pools across the country. According to the Centers for Disease Control and Prevention, 4,000 people drown in the U.S. each year. 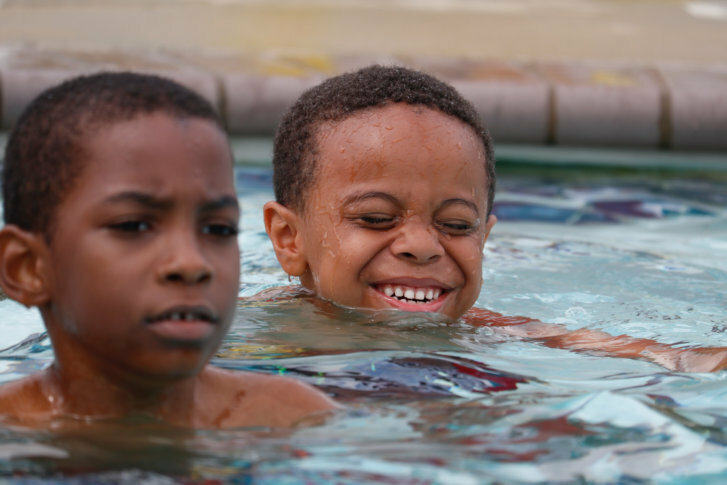 Drowning is the second leading cause of accidental death among children ages 1-14, and the rate of drowning deaths among minority children, particularly African-American children, are five times that of their white peers. Broome, who is African-American, as are many of the students in this class, said the camp is more than just a four-day instruction period. “Swimming is the only skill that can save your life, and it’s the only skill that you can do for the rest of your life,” he said, pointing out that as people age, water-based exercise can allow them to get in a workout that otherwise would be impossible. At the camp, Broome led the kids one by one into the pool, urging them to hold on to him as they built up their confidence and followed his instructions on how to put their faces in the water, hold their breath and come up for air. Broome said he tries to strike a balance between gentle encouragement and challenging a child who is struggling with anxiety around water. “You don’t want to traumatize them,” he said, noting the idea is to build confidence and have fun. Before long, some of the kids were diving beneath the surface and picking up rubber rings that were tossed to the bottom of the shallow end of the pool. Broome said some kids took longer to get over their initial nervousness. “But every year, by the fourth day, I have them jumping in,” he said with a smile. “Nothing is more important than the safety of our kids, and it brings us all great joy to provide kids and their parents the tools to enjoy the water more safely,” Karen Cohn of the ZAC Foundation said in a statement. Along with the poolside instruction, kids at the ZAC Foundation camp got classroom instruction, met with first responders to talk about water safety, and found themselves adopting the names of their assigned groups, such as the Seahorses, Sharks and Dolphins.